Prince was one of the most successful musicians of all time. For over four decades he created a steady stream of Grammy and AMA award-winning music. Behind his music, his troubled childhood and relationships became common knowledge. However, most fans are unaware that in 1996 Prince and his first wife, Mayte Garcia, had a son, Ahmir Gregory Nelson, who died only after seven days of life from complications due to severe Pfeiffer Syndrome. Pfeiffer syndrome is a rare genetic condition, with an average occurrence of one out of every 100,000 births. 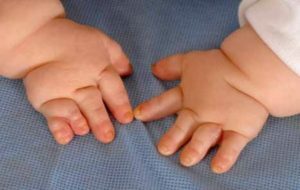 It is caused by a genetic mutation that results in the bones in the skull to fuse prematurely (craniosynostosis), unsual fingers, crowded teeth and facial changes. In severe Pfeiffer syndrome (Type 2 and 3) problems with the organs and brain development may occur and be life threatening. The experience of children who have Pfeiffer syndrome is variable. For some, the condition mainly causes cosmetic facial symptoms. Others may have severe symptoms affecting breathing, feeding, vision and brain development. In many cases Pfeiffer syndrome is caused by a new mutation (de novo) in the FGFR1 or the FGFR2 genes. It is important to remember that there is nothing a person can do to prevent or cause Pfeiffer syndrome. If an individual has Pfeiffer syndrome there is a 50% chance that his or her child will inherit the gene change. However, like many couples experiencing the loss of a beloved child, Prince and Mayte divorced shortly after their son’s death. The new memoir Mayte is publishing about her time with Prince may shed new light into the time the two shared together before, during and after Gregory’s diagnosis. Prince, despite his fame and fortune, was just like any parent, he wanted to protect his child from the world. Unlike many, he silently mourned the loss of his child to a rare and fatal genetic disorder. There is a Natural History Registry for people with Craniofacial Anomalies including Pfeiffer available and there are several wonderful support groups like Pfeiffer Syndrome Support Group, FACES: The National Craniofacial Association and Children’s Craniofacial Association who have many resources for those living with or caring for those living with Pfeiffer syndrome. Learn more about Pfeiffer syndrome at ThinkGenetic.com. Amiir, Prince and Mayte’s baby, in my opinion, could of survived. Yes there are 32 surgeries included in the process, but I see that those children are very intelligent and loving. They needed to prove to the medical staff, to the public and to themselves that they were going to fight till the end for their precious baby. This disease can have so many different impacts from child to child. We can’t know what options may have been available for treating this child or if any may have helped. Instead of focusing on the decisions of the grief-stricken parents for this much-loved child, we should focus on ways to support parents in this heart-breaking situation. Read her book. He had Type 2, severely disabled. He lived for 6 days through lots of surgeries until they decided to stop his suffering and remove him from life support. Heart wrenching and a very personal journey that only they can know. Can’t fathom a worse scenario. Helpless to help your baby survive. I would have loved my baby so much to let him go as well. Best decision they could have made. God bless them.